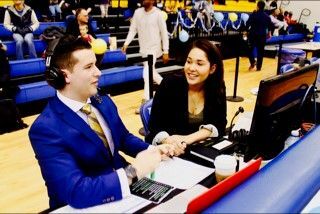 As the Ryerson Rams senior players reflected on their time with the team at Senior Night, colour commentator and former player Jaime Hills was also reflecting. A cross-town rivalry match with the University of Toronto Varsity Blues set the tone for a tribute to the Ryerson Rams’ senior basketball players. As these veterans were contemplating the end of their time as Rams, Hills has already passed this milestone. In 2018, the North Vancouver, B.C. native would have been receiving the same farewell ceremony as a member of the women’s basketball team. 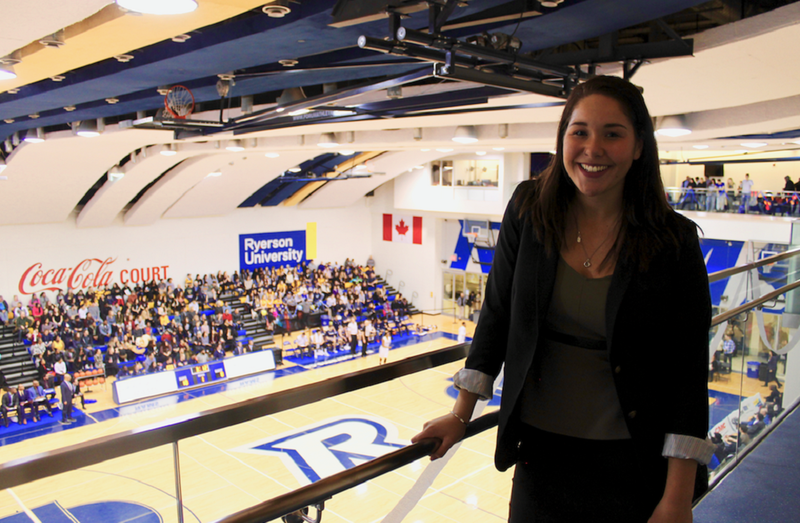 Instead, she watches the ceremony from the broadcast booth as an analyst for Rams Live, Ryerson’s broadcast team. Seeing her friends and former teammates honoured on the court impacted her greatly. Hills’ journey to this point began in her home province of British Columbia. As a lifelong fan of the UBC Thunderbirds, Hills was an easy commit to the school’s basketball program in 2012. With her future in U SPORTS basketball secured, Hills began the kinesiology program at UBC. She would remain for two years as a member of the Thunderbirds until another opportunity arose. 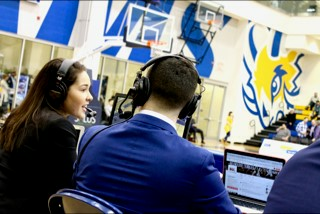 When the Sport Media program began in the RTA School of Media at Ryerson, Hills applied, having been interested in a broadcast journalism career in sports even before committing at UBC. Upon being waitlisted for the full program, she had a decision to make. Among what Hills figured out was that she was certain of her wish to work in sports broadcasting, Ryerson was her destination, and she was going to be a Ram. The Ryerson Rams had gone through a complete athletic overhaul in these years, and were inching closer to becoming a perennial OUA powerhouse. But an OUA title continued to elude them. Hills joined the team for the 2015-2016 season, a breakout year for the Rams in both the men’s and women’s basketball programs. Claiming the title in her first year with the Rams left a major impact on Hill’s career, listing it as at the top of her achievements in U SPORTS women’s basketball. Despite the success she found with her new team, Hills was feeling the strain between the world of athletics and sport media. After discussions with Rams head coach Carly Clarke, Hills chose to leave the team in December of 2016, partway into the season. With her career path on her mind, she found the support of her coaches and teammates in her decision to turn to commentating for the team. Despite no longer being at practice or alongside teammates on the bench, she has found a new strength in the personal ties she has to the team as an analyst for the Rams. Alongside Hills in the broadcast booth every game is play-by-play commentator Adam Jenkins, another student of RTA’s Sport Media program. The on-air chemistry between the pair translates into Jenkins’ journalistic project, the Canadian University Sports Network (CUSN). The independent source of Canadian university sport news and analysis now benefits from Hills’ experience and passion for telling sports stories. Through CUSN, Hills is looking to highlight those senior players such as the ones Ryerson honoured before the game against the Varsity Blues. Through a new weekly column Senior Spotlight Sunday, Hills explores the playing careers of those who are about to move on from their years in U SPORTS.